Oh sweet girl, I love that you love fall as much as I do! I loved reading your answers and candy corn is the BEST! I forgot about good old chicken noodle soup! I love it! Soothes the soul! As much as I love football, I totally understand why people don't like it! I have to admit that the only reason I actually watch the NFL is because of Fantasy Football. And yes to PSL! It's so good! Well now I want to try an apple cider frosted donut! I have never seen one before, but I need it! I can remember the days of jumping in leaves... those were fun... the raking part? Not so much. red apple for sure! i hate green apples. i love Strawberry Shortcake, so if i dressed up as a kid i totally would have dressed up as her! oh I love fall.. boots and soups, cozy clothes.. hands down favorite season! I bet you were a cute Strawberry Shortcake!!! I need to go buy my annual bag of candy corn. I just love it! October-December is my most favorite time of year. Yes to PSL! I just tried the new Maple Pecan latte and I was not impressed. I should have stuck with my favorite! And yay for Will & Grace being back! I don't think I've ever had an apple cider frosted donut, but that sounds amazing! I love candy corn too, but try not to buy it because I end up eating way too much! 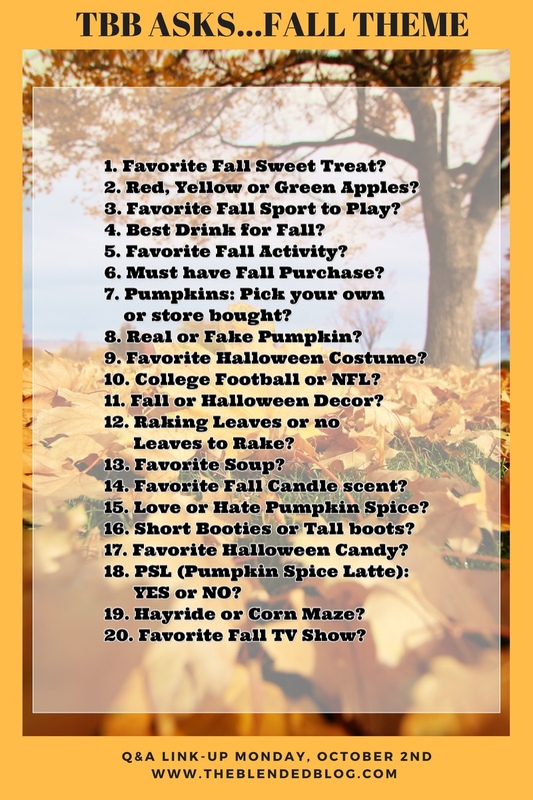 I did notice that only you did the post :) I love apple and pumpkin everything as well!!! Girl, I'm with you. I hate football! Thanks for sharing, I always love these kinds of posts!